As you will see from my other blogs, I’m a big fan of ‘make do and mend’ and ‘do-it-yourself’ crafts, to save some pennies. 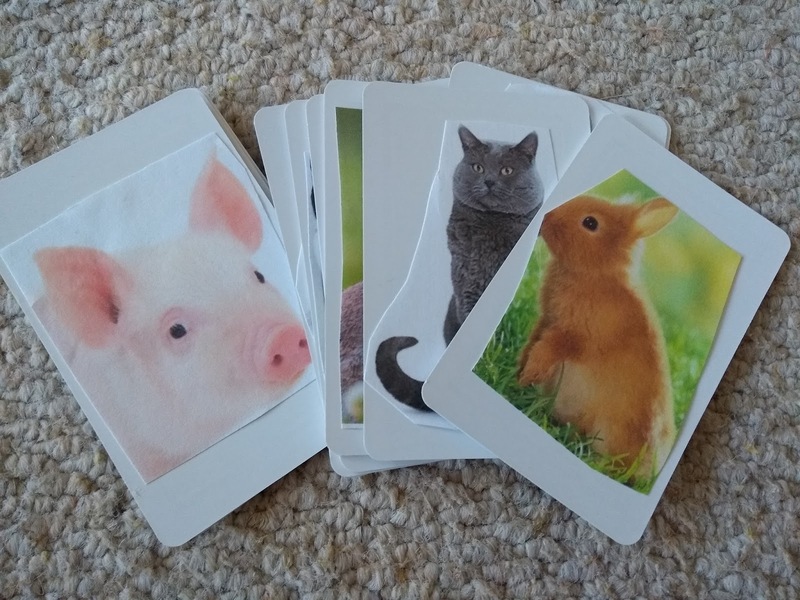 I did buy my daughter some flashcards from an online shop, with a number of different pictures and words on, (which she really likes), but I thought I could make my own card games and I could add new words she is learning, as she learns them. 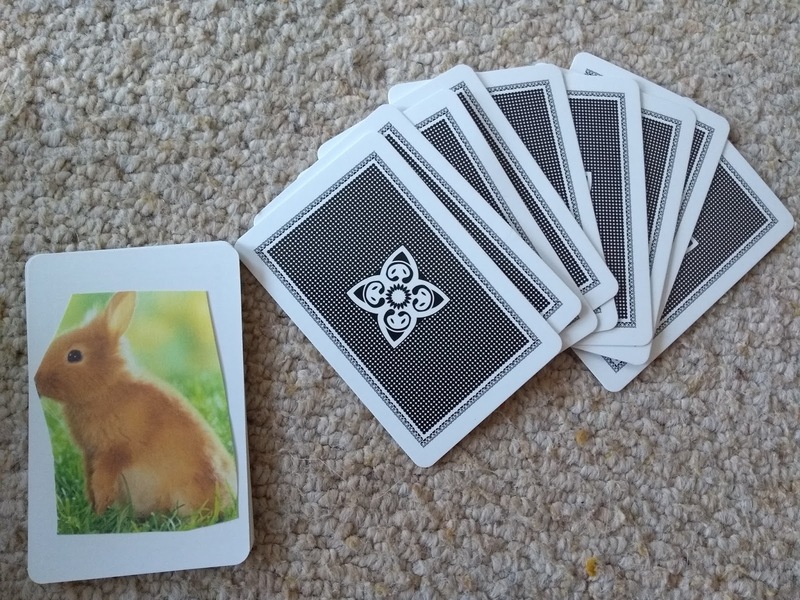 This card game is an animal game. My daughter knows some of them but I wanted to help her differentiate between them. Her favourite thing to do now that she’s hit 17 months is to point and say “what’s that?” So I thought this would be fun way of learning, and it’s been snowing, so I have no intention of wandering around a cold farm on a day like this! A printer to print off 4 different pictures of each animal, which included cartoon pictures and photos. Blank playing cards, these ones are available on this link: https://www.amazon.co.uk/dp/1858116090/ref=cm_sw_r_cp_awdb_t1_IrPLAbMVP301Q&nbsp; what you could use instead of these, if you wanted to save even more pennies, is old playing cards. 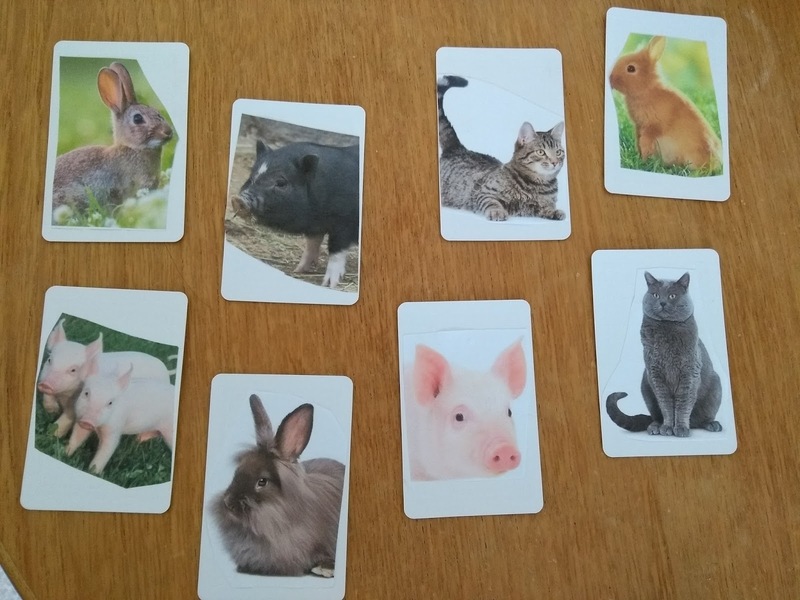 For my version of the game I have 4 pictures of different cows, 4 of pigs, 4 of rabbits, 4 of cats, 4 of dogs and 4 of chickens. If/once she learns these words, I can add some other animals to the game. This game is simple and involves putting the cards down face up, mixed up. I ask my daughter if she can find the “pigs” or the “cows” etc and the game is to pick them out from all the different animals. Showing her that the same animal can look different, but be the same, depending on its colours or breeds. The game is also to help with word association and to encourage her to pay attention. You could also play this game with the cards turned over, so that your toddler has to find the animals. Another way of playing this game would be to have buckets with another picture of the animal on/ or the word, (if they are older), and asking for your child to sort them into the right buckets. Hope you enjoy playing this card game with your little ones! I’ll be coming up with some other toddler games soon. Thank you! It’s definitely a great idea for rainy days in! Thank you! We hope you can find them as fun as Charlie does! Let us know how you get on with them!! Previous Post Mental Health Monday: 6 forms of therapy you should be trying!